A team of physicists from Immanuel Kant Baltic Federal University together with their colleagues from National Research Nuclear University MEPhI (NRNU MEPhI) has developed a tungsten oxide-based detector of hydrogen in gas mixes. They manufactured thin tungsten oxide films with various additives and compared their characteristics. One of the film detectors demonstrated a 100-fold increase in sensitivity when compared to a control sample. The article was published in Thin Solid Films. Hydrogen is one of the most widely used gases in the world, used in the chemical industry and in controlled nuclear fusion experiments. Its molecules have the smallest possible mass and size, and it is therefore extremely difficult to store in any vessel, as it leaks from almost any opening. Hydrogen leakages are very dangerous for industry, as hydrogen mixed with oxygen forms explosive detonating gas. With the development of the hydrogen energy sector, the prevention of leakages becomes an important safety issue. To prevent hydrogen leaks, its concentration in an industrial facility should be constantly monitored. Usually this is done with gas detectors, the most popular of which are amperometric analyzers. They are based on the ability of gases to change the electrical conductivity of metals upon contact with them. In the course of measurements, fixed voltage is applied to the ends of a metal plate, and a device measures the strength of current going through it. As the strength of current directly depends on the conductivity of a material, when the concentration of hydrogen increases, conductivity changes as well. The sensitivity of measurements is determined by the properties of the sensor, i.e. the plate under voltage. BFU scientists and colleagues from NRNU MEPhI studied new materials based on tungsten oxide (WOx). One of them was obtained by means of depositing WOx on a silicone carbide (SiC) substrate. 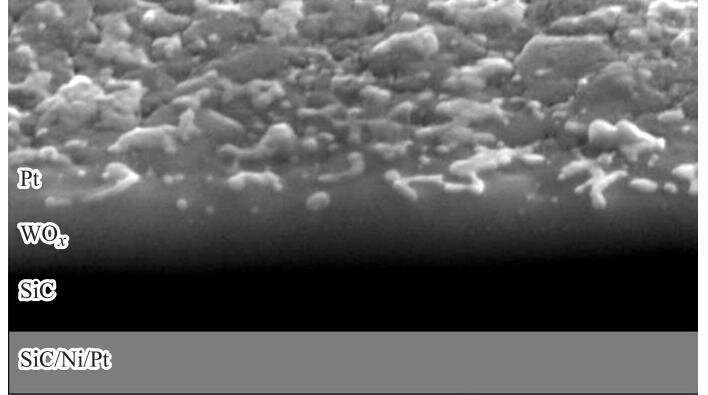 Another material was developed in the same manner, but the tungsten oxide layer was covered with additional platinum coating. Then the scientists determined the sensitivity of the two films by applying voltage to them and putting them into an oxygen environment. After that, 2 percent of hydrogen was added to it. The material without the platinum coating demonstrated a 15-fold increase in the current strength compared to pure tungsten oxide. When the same property was measured in the second material, it showed a 100-fold increase. "We have studied nanomaterials that may be used as a basis for hydrogen leakage sensors. In the course of our work, we identified the requirements for the structural properties of these materials that should secure high gas detecting efficiency," says Dr. Alexander Goikhman, a co-author of the work and the head of the Research and Educational Center for Functional Nanomaterials.